Amr is the founder of InfoTimes, a firm that has produced a good amount of information graphics for local companies. He is an enthusiastic and tireless data evangelist, so consider the short interview below my shameless attempt to promote his work. How did you get interested in data journalism, infographics, data visualization, etc? I have more than ten years of experience as a business editor. I’ve always loved to work with data. I deal with numbers all the time. Nowadays we have a lot of leaks, a lot of data everywhere. With very simple tools we can find stories inside it. I love this part, finding stories inside data and make it readable and shareable. At the end of 2012 I was participating in boot camp organized by ICFJ in Amman. One of the sessions was about infographics. This session inspired me to create a small studio to visualize data. We work for clients like Yahoo Maktoob, Akhbar Elyoum, and Petra, the Jordan news agency. We were shortlisted by GEN’s data journalism awards this year. We are a small team: 3 journalists, 2 graphic designers, 1 developer, and 1 animator. Sometimes I design, but you can't call me a graphic designer. I'm a journalist who can use graphic design software to present a story in an effective and attractive manner, but my main role is managing the team, besides analyzing data and transform it into stories. I also train journalists. I'm working with BBC Media Action, Internews and Free Press Unlimited. And right now I'm learning to code. I believe that learning how to code is as relevant for a journalist as learning how to make an interview or writing a story. You are busy! And besides all that, you wrote a book about data journalism. How did that happen? It took me two years to write the book. There are no books in Arabic about data journalism, visualization, etc., besides the translation of the Data Journalism Handbook, which is good, but that is not designed for Arab audiences. So it was an obvious opportunity. That's surprising. 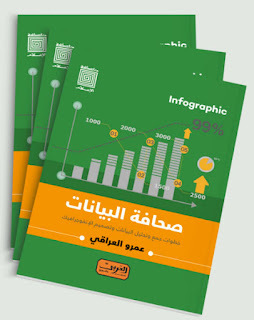 Are newsrooms in Egypt and its neighboring countries ready to embrace data journalism, infographics, etc? Well, we've done more than 100 entry-level workshops just here, in Egypt, and some in other countries like Algeria, Turkey, and Jordan. There is great interest, but very little knowledge. We do two kind of workshops. One is about data-driven journalism, and it covers topics like how to find data, scrape it, using spreadsheets to analyze it, etc. The other one is about visualization. It deals with how to select the best graph or map for your data, color, and then how to use online tools like Piktochart and Infogr.am. Tell me about the book, its contents, structure, etc. The book has three chapters. The first one is an introduction to data journalism. The second deals with how to find, scrape, clean, and analyze data. The third is about visualization. It can be ordered online from all Arab-speaking countries, besides having a presence in book fairs. The second chapter is a relevant one. Getting government or official data in Egypt isn't easy. We don't have an equivalent to FOIA requests here. You can ask official sources for data but you are never sure if they will give it to you or not. Besides, data is never machine readable, as it's always in PDF format. I'm working with several partners to change the situation here. For instance, I've made two workshops for employees in several ministries. I gave them a series of recommendations. One of them was not to use PDF! Also, we've done a data for good event in collaboration with the International Development Research Centre. Let's talk about freedom of the press in Egypt. Do you receive pressures or are limited in any way? The situation is very hard in Egypt, under the current regime. Egypt has turned into an Iran-like country. The government is surrounded by a virtual red wall, and it's very risky for any journalist to trespass. To be safe you have to work and focus on social topics, not political ones. In Egypt right now there is only one tune, and you are required to sing along. You need to be outside of Egypt to be able to freely write about Egypt. When our friend Hossam Bahgat reported about the corruption inside the military, he was arrested. How data journalism, which is intrinsically linked to investigative reporting, thrive in an environment like that? We are trying to work on that. Sometimes we need to report on wrongdoing in an indirect way. For instance, we cannot say that the government is mismanaging expenditures. So we created a calculator. Readers can input their monthly salaries, and the application shows them which portion of their taxes gets directed to different areas like education, healthcare, etc. Then, maybe they can make an inference.